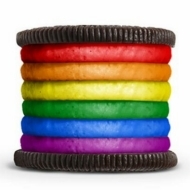 Oh man: The Kraft Food Facebook page got a dose of pride yesterday when the official image was temporarily changed to a rainbow Oreo. (It appears to be gone now.) We absolutely applaud Kraft and Nabisco for taking a stand, but it’s almost as if the company was trolling its more, uh, conservative customers.